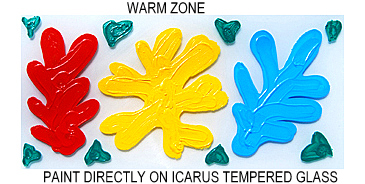 Media Applications | Icarus Art Drawing Board: Fresh new look at wax based mediums! Colored pencils are the hardest of the wax-based drawing media. 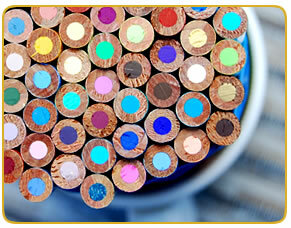 Even the softest colored pencils contain a relatively small amount of wax in comparison to wax crayons or oil pastels. For this reason, the effect of heat on colored pencils becomes noticeable when the surface is almost saturated with waxy pigments. It is at this point of "almost saturation" that mixing, blending and burnishing take on a new dimension. The pigments become softer and more malleable; they truly mix together and not layer on top of each other, while blending and burnishing are achieved quickly and smoothly. A colorless blender is useful on the warm zone for blending, especially in tight spaces. Great for smoothing and blending. To protect your art from staining and smudging, place a cotton towel between your arm and your work. A thin "flour sack towel" works great for this purpose. This towel prevents any oil from your skin to come in contact with your work. At the same time it makes the temperature of the warm zone more comfortable (the towel can be doubled up if necessary). 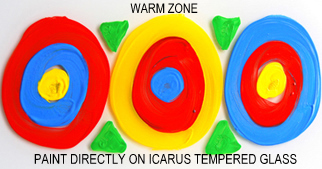 COOL ZONE and WARM ZONE apply to the Icarus Drawing Board. Line Drawing: use the cool zone for fine lines and strokes, the warm zone for thicker and denser lines (as the core of the pencil softens, the lines become thicker). Blocking in: use the cool zone for gradual color build-up, the warm zone for fast blocking in. Burnishing: use the warm zone for quick and effortless burnishing, the cool zone for gradual color build-up. Mixing: use the warm zone for true mixing. Burnish your lightest color first, follow with your darker color and blend with a gray paper stump. Colors are smooth and saturated as paint. Layering: use the warm zone for fast and saturated layering. Burnish the first color, apply the second one using the side of the pencil and blend with a gray paper stump. Use the cool zone for gradual color build-up. Gradation Layering: use the warm zone for fast and saturated layering. Burnish the first color, apply the second one using the side of the pencil and gradually increase the pressure to deposit more pigment. Blend with a gray paper stump. Use the cool zone for gradual color build-up. Reworking: when the surface is saturated with waxy pigments, use the warm zone to penetrate and rework the layers of colors. When most of the original pigments are displaced by heat, layer even more color on top. Speckling: grate your colored pencil on coarse sand paper and shake the speckles over a burnished area. Move it to the warm zone, cover it with tracing paper and press down with a brayer. The speckles will melt into the surface and create a very interesting texture. See also Ester's post on her blog titled "Speckling Technique for a Starry Sky"
Mixed Media: when colored pencils are combined with other wax-based drawing media on the Icarus Boards, the possibilities are endless. Click here to go to the MIXED MEDIA section for more details. Artist crayons are artist grade “wax crayons” also known as “wax pastels”. They are softer than colored pencils but harder than "oil pastels". They can be water soluble or water resistant and both types perform equally well on the Icarus Boards without solvent or water. Only artist grade wax crayons and pastels are recommended. There are many brands of artist crayons on the market. Depending on the type and amount of wax present, heat will cause some of them to soften, others to liquefy. Colour Shapers are shaped like a brush with a tip made of silicone or rubber. They are also known as "Clay Shapers" or "Wax Movers". They usually come in three different color tips: white, gray and black. The black ones are the sturdiest. They are used for mixing, moving and blending the waxy pigments of artist crayons and oil pastels. Great for blending and thinning artist crayons. Line Drawing: use the cool zone for fine lines and strokes, the warm zone for thicker and denser lines. Blocking in: use the cool zone for gradual color build-up, the warm zone for fast blocking in. Watch how the crayon softens and melts on the warm zone. Thinning: use a gray paper stump (or a Colour Shaper) on the warm zone to thin out excessive waxy pigments. This will enable the surface to accept additional layers of colors (especially helpful when layering colored pencil on top of crayon). This technique is great for underpainting. Mixing: mix two or more colors together on the warm zone by moving the waxy pigments around with a Colour Shaper. Blending: lay down the lighter color first (yellow) and add the darker color on top (red). Blend on the warm zone with a Colour Shaper or a gray paper stump. Gradation Blending: lay down the lighter color first (white) and add the darker color on top (blue) by gradually increasing the pressure to deposit more pigment. Blend on the warm zone with a Colour Shaper or a gray paper stump. Layering: usually accomplished on the cool zone to allow the pigments to lie on top of each other. Reworking: layers can be remelted and reworked on the warm zone. Sgraffito: apply a thick bottom layer as a base. Cover with a top layer and scratch to reveal bottom colors. Monotype: apply crayons directly on Icarus Drawing Board tempered glass (use a crayon that liquefies). Cover the image with an absorbent paper, press down with a brayer and peel off the paper to reveal the monotype. Oil pastels are the softest of the wax-based drawing media. They are made of pigment mixed with a non-drying oil and wax binder. 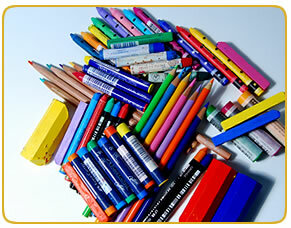 There are many brands of oil pastels on the market. Depending on the type and amount of wax present, heat will cause some of them to soften even further, others to liquefy. Only artist grade oil pastels are recommended. Colour Shapers are shaped like a brush with a tip made of silicone. They are also known as "Clay Shapers" or "Wax Movers". They usually come in three different color tips: white, gray and black. The black ones are the sturdiest. 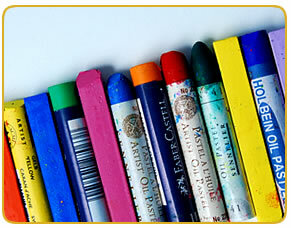 They are used for mixing, moving and blending the waxy pigments of oil pastels and artist crayons. Great for blending and thinning oil pastels. Lines Drawing: use the cool zone for finer lines and strokes, the warm zone for thicker and denser lines. Blocking in: use the cool zone for gradual color build-up, the warm zone for fast blocking in. Watch how the oil pastel softens and melts on the warm zone. Thinning: use a gray paper stump (or a Colour Shaper) on the warm zone to thin out excessive waxy pigments. This will enable the surface to accept additional layers of colors (especially helpful when layering colored pencil on top of oil pastel). This technique is great for underpainting. Blending: lay down the lighter color first and add the darker color on top. Blend on the warm zone with a Colour Shaper or a gray paper stump. Gradation Blending: lay down the lighter color first and add the darker color on top by gradually increasing the pressure to deposit more pigment. Blend on the warm zone with a Colour Shaper or a gray paper stump. Monotype: apply oil pastels directly on Icarus tempered glass (use an oil pastel that liquefies). Cover the image with an absorbent paper, press down with a brayer and peel off the paper to reveal the monotype. Combining wax-based drawing media on the Icarus Boards allows for countless and creative applications. 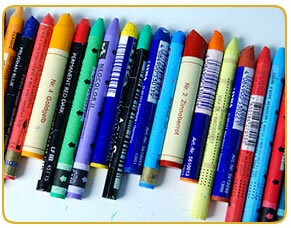 There are three main categories of wax-based media that are particularly suitable for this technique: wax-based colored pencils, artist crayons and oil pastels. Great for blending colored pencils, artist crayons and oil pastels. Colour Shapers are shaped like a brush with a tip made of silicone. They are also known as "Clay Shapers" or "Wax Movers". They usually come in three different color tips: white, gray and black. The black ones are the sturdiest. They are used for mixing, moving and blending the waxy pigments of artist crayons and oil pastels. Layering CP over AC or OP : apply artist crayon or oil pastel on the warm zone for fast coverage. Use a gray paper stump to thin out excessive waxy pigments for a smooth underpainting. Layer colored pencil on the cool zone by using the side of the pencil. Blending CP over AC or OP : apply artist crayon or oil pastel on the warm zone (Drawing Board) or with the heater ON (Painting Board) for fast coverage. Use a gray paper stump to thin out excessive waxy pigments for a smooth underpainting. Layer colored pencil on the cool zone by using the side of the pencil and blend on the warm zone with a gray paper stump. Detailing CP over AC or OP : apply artist crayon or oil pastel on the warm zone for fast coverage. Use a gray paper stump to thin out excessive waxy pigments for a smooth underpainting. Add details in colored pencil on the cool zone by using the point of the pencil. Texture No. 1 - CP over OP: apply oil pastel on the warm zone. Use a gray paper stump to thin out excessive waxy pigments. Place the paper on a textured wall or other textured surface and rub a colored pencil over it by using the side of the pencil. Texture No. 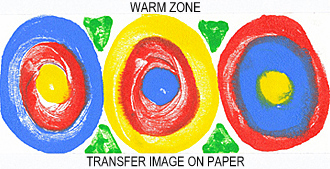 2 - OP over AC : apply artist crayon on the warm zone and create a texture as it melts. On the cool zone rub a soft oil pastel by its side over the texture. Texture No. 3 - AC over OP : apply oil pastel on the warm zone. Use a gray paper stump to thin out excessive waxy pigments. 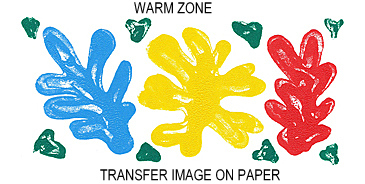 Add artist crayon shavings on the warm zone and let them melt (use a melting crayon). Sgraffito - OP over AC : apply artist crayon on the warm zone. Layer with a soft oil pastel on the cool zone and scratch to reveal the bottom colors.